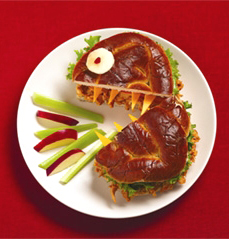 Here’s a monster of an idea: a sandwich that looks like a monster—but is cute enough to eat. Those Cheddar teeth aren’t sharp! CAPSULE REPORT: This is the fifth of six award-winning, delicious and nutritious recipes developed by children in Jif’s annual “Most Creative Peanut Butter Sandwich” college scholarship contest. Click on the black links below to see the other recipes. For more peanut butter recipes and product reviews, visit our Gourmet Peanut Butter Section. The Peanut Butter Monstwich, created by 12-year-old Ian Gray of Shrewsbury, Pennsylvania, is a twist: Instead of the monster taking a bite out of you, you can devour it! And the mix of barbecue chicken and peanut butter in a pretzel roll is positively delicious. Mix the peanut butter, apple cider and barbecue sauce in a small frying pan on medium-low heat until melted together. Shred the chicken using a fork. Add the shredded chicken and stir until evenly coated with the sauce. While the chicken heats thoroughly, fashion the eyeball from a thin slice of apple and the teeth from a thin slice of Cheddar cheese. Use the apple peel for the pupil, and lettuce for the eyebrow. Heat pretzel roll in microwave for 10 seconds. Split pretzel roll. Spoon chicken onto half of roll; top with tomato, lettuce and the other half of roll. Cut sandwich in half and pull two halves apart at an angle as shown in the photo at top. Insert “teeth” and attach “eye” on top of sandwich using a dab of sauce. Serve warm with apple and celery sticks.